We will discuss each of these types in more details below. During creation of SAP cost elements, they should be assigned to a category which is known as cost element category. So, the primary cost elements category technically determines which transactions can be used for a particular cost element. Above are just few examples of the cost element categories. Different categories can be used as per the business requirement of companies. Cost elements are defined in the controlling module of SAP and are assigned to various objects such as cost centers, internal orders, etc. Basically, their function is to classify and analyze the cost for internal reporting purposes. The integration between the expense accounts in financial accounting and cost elements in management accounting is essential for reconciliation purposes. Therefore, posting to a primary cost element is done through a posting to a G/L account. All the primary cost elements have a corresponding P&L G/L account in FI. The primary elements should be assigned to a corresponding object in CO such a cost centers, an internal order, etc. This is necessary for the identification of the origination of the cost. The revenue element is also a primary cost element but unlike primary cost elements it has a corresponding revenue G/L account in the chart of accounts under the P&L. The prerequisite for creation of these elements is to have a corresponding G/L account(s). Without them the SAP system will not allow to create primary cost or revenue elements. Let’s look at some examples. Material costs, personnel costs, salary costs are different type of costs which are posted to P&L of G/L accounts which in turn are allocated to primary cost elements. These elements are only used in CO for the identification of internal costs for settlements or assessments. Unlike primary cost elements which have corresponding G/L accounts, secondary SAP cost elements do not have G/L accounts associated with them. They are used in overhead calculation, internal cost allocation, settlements, etc. 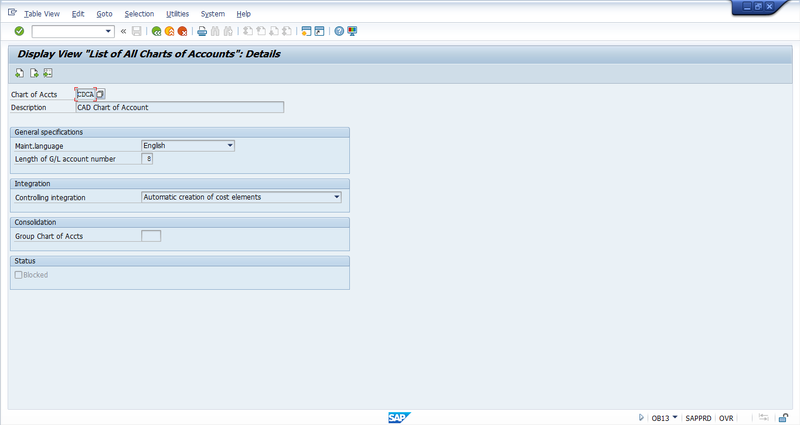 If the SAP system finds that there is a corresponding GL Account during creation of a secondary cost element, it prohibits its creation. Let’s look at some examples. Production cost, material overheads are allocated internally or settled internally through primary cost centers and internal orders for internal requirements of the business. There are two ways to create primary cost elements: manual and automatic. On the initial screen enter the controlling area in which you want to create a cost element. 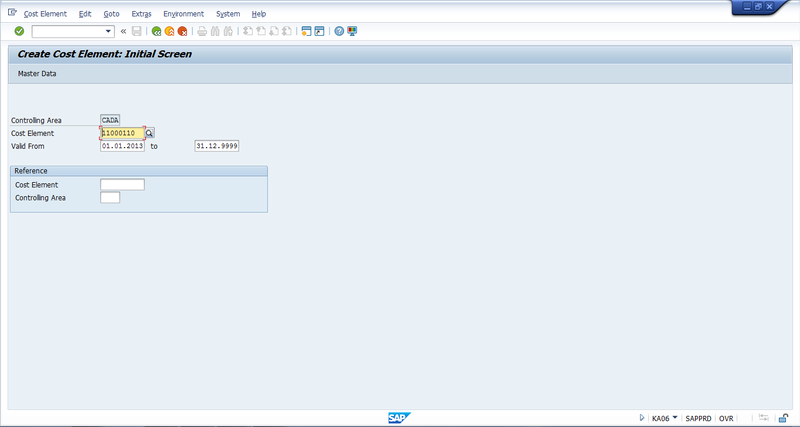 Next, enter number of the cost element that has to be created with validity dates and click on Master Data button. The system will take you to the next screen. Here, you should give the name and description of the cost element and choose cost element category number on the Basic Data tab. Next, you should click Save button. After saving, the cost element will be created. The system creates cost elements automatically as you create G/L accounts. The numbers of cost elements are the same as numbers of G/L accounts. Select the chart of accounts of your company and click on button. 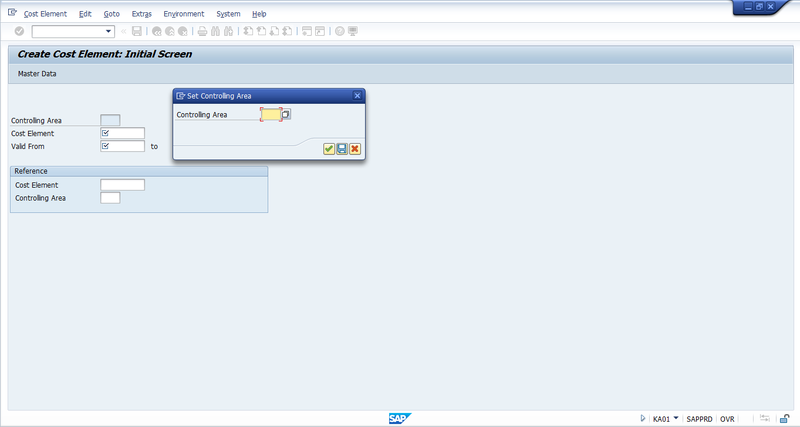 On the next screen select “Automatic creation of cost elements” in the controlling integration field. Click save button . Enter the chart of accounts on the initial screen and press OK button. Next, you should enter account numbers in “Acct from” and “Account to” columns and corresponding cost element categories in “CElement cat.” column. When you enter numbers of G/L accounts in “Acct from” column, the SAP system will select one or several accounts according to the account number given in “Account to” column. Then, it is necessary to save these settings. Overall, the procedure is similar to creation of primary cost elements. G/L Accounts are not needed for creation of secondary cost elements as these elements are used exclusively for internal cost analysis. Posting to primary SAP cost elements is automatic and is done when you enter a document in financial accounting. For example, in transactions such as FB01 where users need to enter a cost center. Secondary cost elements cannot be directly posted like primary cost element. They are used for internal allocation between cost objects such as cost centers, internal orders, WBS elements, etc.